Distilled in 1991 – the heart of an era now famed for producing full, fruity Irish single malts – this is a spectacularly fruit-led and flawlessly balanced whiskey. 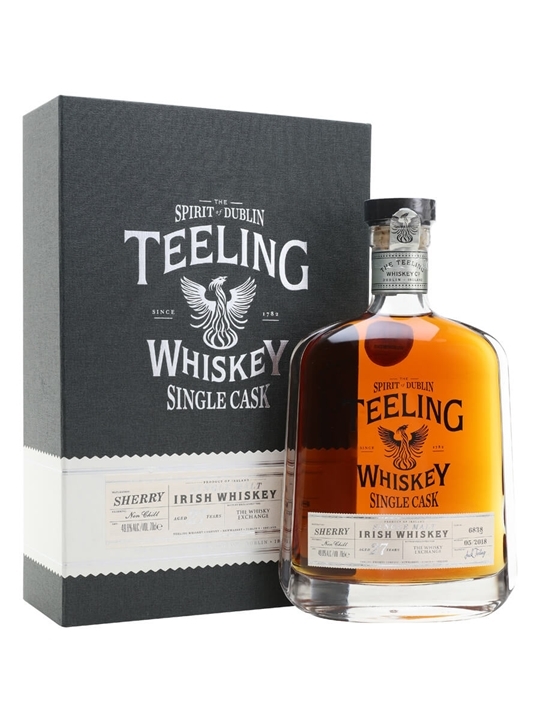 An impressive addition to any collection and a wonderful whiskey by anyone's standards, this is a single, sherry-cask single malt hand-picked by The Whisky Exchange team from Teeling's incredible stocks. Nose: Outrageous tropical fruit juice. Immediately there’s a thick, ripe pineapple aroma and a deep sweetness. Noticeably, there is a complete lack of raw alcohol here; every drop is a vessel for pineapple cube sweets and luscious mango. There is plenty of sherry influence, too – some light clove and fruitcake character, dark molasses, nuts that have gone soft in Christmas pudding and a hint of flat cherry coke – but all of that just serves to provide a solid foundation from which that huge tropical aroma can leap out. Palate: Soft and smooth on the tongue, then bursts open to fill the mouth. Very light; nutty, woody and drier than the nose suggests. It becomes, all of a sudden, a mature, complex single malt whiskey. Full-figured toffee and creamy vanilla intertwine with old wood and dark, earthy loam. Finish: The finish feels short, but only because it’s so smooth – it slinks off, cat-like and quiet. Oak, earth and damp autumn leaves compete with sherry fruit: cherry and a little dry clove. Comment: A full and exciting whiskey which belies its age. Vibrant fruit balances beautifully with the big oaky influence, while sherry cask maturation fills in all the gaps, shoring up wood with rich spice and lending deep, cakey reinforcement to a cornucopia of magnificent citrus. A dream Irish dram. Nose: Pineapples and marzipan. Raisins and mangoes. Pears and polished oak. Sultanas and kiwi. Glacé cherries and Danish pastries. A pile of pairings. Layers of fruity flavour, interleaved with buttery pastry and brown sugar. Rich sherry-cask fruit and spice hide at the back, providing a backdrop as fresh, zesty fruit bursts out of the glass. Palate: Thick fruit rolls across the palate, changing as it goes. Apples and pears lead to unripe pineapple, fresh peeled kiwi fruit and candied guava. Cinnamon-bun brown-sugar sweetness is balanced by gentle barrel char. Rich fruit cake sits at the back, studded with glacé cherries and singed raisins. Damp oak and leafy touches slowly develop: elegant old-forest rancio notes. Finish: Polished oak tables dusted with brown sugar fade to leave a spicy core of anise and burnt raisin. Oaky spicy lingers. Comment: An incredibly complex dram, balancing the tropical fruit that we've come to expect from these early-1990s malts against a sherry cask that has added in rich layers of dark-fruit flavour without hiding the spirit. Very impressive. Amazing, compared to redbreast 25 this one is more exotic with same depth and quality.